Hearing loss is most common as we grow older, but it can still affect us at any stage of life, even childhood: Hearing loss affects children, too. Learn about testing hearing for children at Arnold Hearing Centres. Otitis media is the most common cause of hearing loss in children. It’s an inflammation of the middle ear, just behind the eardrum, usually connected with a build-up of fluid; in children, the Eustachian tube between the middle ear and the back of the throat is both smaller and less angled than it is in adults, which means it can be blocked more easily. Sometimes the fluid is infected, but not always. Infected or not, it tends to cause “conductive” hearing loss—it prevents sound information from being conducted through the inner ear to the brain. In the case of infections, otitis media can be easier to detect, since an earache and fever are often involved. Most often, hearing loss related to otitis media is temporary, but if a child experiences otitis media repeatedly, it’s possible that the eardrum, sound-transmitting bones, and even the hearing nerve can be damaged, causing permanent hearing loss. If your child develops an ear infection, get to the doctor right away. While the sense of hearing becomes active in most people by around 16 weeks in the womb, there are people who are born with hearing difficulties. Hearing loss that is present at birth is called “congenital” hearing loss. More than 50% of congenital hearing loss cases are believed to be caused by hereditary genetic issues. Other causes include, but aren’t limited to, prenatal infections, illnesses and toxins consumed by the mother during pregnancy. Other conditions that can result in congenital hearing loss include, an infection within the womb, prematurity, maternal diabetes, toxemia during pregnancy and lack of oxygen (anoxia). Acquired hearing loss is simply hearing loss that occurs after birth, so it isn’t child-specific. Several factors put children at risk: ear infections, ototoxic drugs known to affect hearing, meningitis, measles, encephalitis, chicken pox, influenza, mumps, head injury, and noise exposure. Noise exposure deserves special mention among the causes of childhood hearing loss. Once upon a time, hearing professionals worried about loud music on phonographs or tape decks. With the advent of earbuds, video games and an endless stream of media via smartphones, we’re concerned about excessive volume being pumped directly into children’s ears. Please, monitor your children’s use of earbuds. Does your child get frequent colds and ear infections? Does your child not understand people without facing them? Does your child speak loudly, as if having trouble hearing himself/herself? Does your child always turn up the volume on the TV or radio? Does your child often not respond when called? Does your child need to have things repeated? Is there a history of hearing loss in your family? Did your child experience a lack of oxygen at birth? 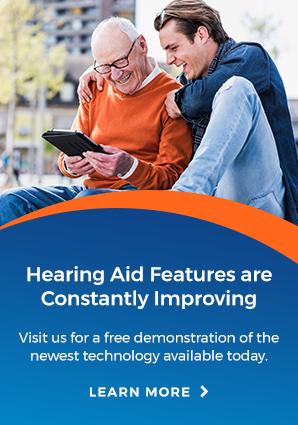 Early detection is incredibly important in dealing with hearing loss. If you suspect that your child, age 4 or older, has a hearing problem, contact us right away at Arnold Hearing Centres for a thorough, and comprehensive hearing evaluation. For those with children under 4, please let us know and we can provide you with information on who to contact.